There is a myth that you have to sit in full lotus pose or look like a human pretzel to meditate. 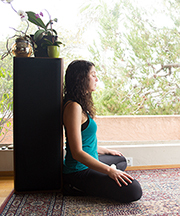 The reality is that you can meditate in any position as long as you’re comfortable. With that said, there are some important guidelines when you’re finding a seat for meditation. 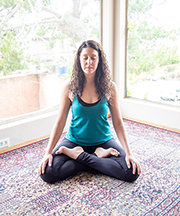 The first thing is simply to sit up straight—on the floor, on a cushion or in a chair—it doesn’t really matter where, but a straight spine will help you to stay alert for your meditations. 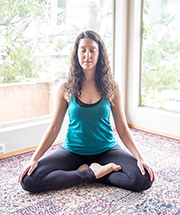 You want to feel alive and energetic while you meditate—physically and mentally—and sitting in a physical position that is upright encourages that alert state of being. Try it out so you can experience the difference. You’ll likely find it’s actually much easier to sit for longer periods of time when your spine is stacked properly, as opposed to slouching. When you’re hunched over, not only will that promote a tired feeling, it’s hard to maintain for longer stints of time and you can hurt yourself, causing pain in the back and neck as gravity pulls you down. If sitting up straight is painful or uncomfortable in any way, lean against a wall or piece of furniture for support to encourage your vertebrae to be stacked. Remember, your number one rule for meditation is to be comfortable, so feel no shame for using props. 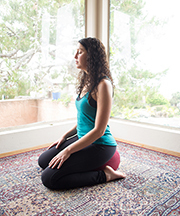 If your hips are tight or your knees feel achy when you sit on the floor, you have options. 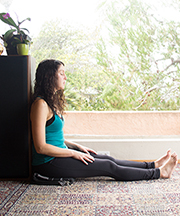 Sitting in a chair is a great place to start meditating, just find a chair that doesn’t invite you to slouch. Notice if your favorite love seat encourages you to sink, and make a choice that will better support your upright position. Over time, you may find that you become more flexible and may want to explore other positions. Laying down is not the best option for meditation, but if you are in pain or there is some reason where you cannot sit comfortably, it’s absolutely fine to lie down. 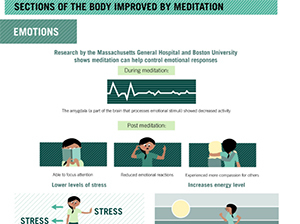 There are some meditations that actually call for lying down, such as the body scan. But typically, this is not the position you’ll use for your consistent practice. 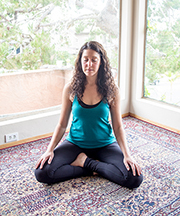 Check out these eight variations for seated meditations. The list starts with the easiest variation and gradually gets more difficult. 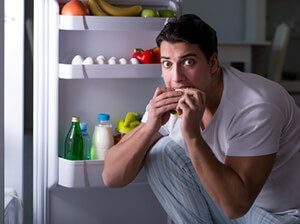 Remember that everyone has a different body—you may find that crossing your legs for more than five minutes at a time makes your right shin fall asleep or your big toe go numb. You may find that one variation allows for a straighter spine. Try them all to find out what will work best for you. thank you so much for sharing your special gifts and talents to the world which is the only reason I found you! I am so grateful to receive this for inspiration as well as your personal story…you give me such hope as I too am in the corporate world full time at this point in my life…it is a true balancing act. I appreciate your enthusiasm and outlook…it has allowed me to see with new lenses this world in which I now live. Hello I’m sorry to bother you with a silly question, I’ve been just recently having pain when sitting in the full lotus for extremes periods of time, 15-45 min. So much pain that I have to slowly unwind myself and still find it difficult to move for a while. I think it is the onset of arthritis becouse it’s worse when it’s cold and it has only recently started but do you have any recommendations. I was not using a pillow or anything for a long time and have recently scence the pain started and I’ve stopped using the lotus all together. How ever it still condemns me. Hi Patrick. Thank you for your question. I don’t consider any questions silly. :) I recommend trying to sit in a chair for support during meditation. Or, if the floor is your preference, try using a cushion for easy pose, or even Burmese position (my personal favorite). The last thing you want in meditation is to be distracted by pain. The good news is there are so many options aside from Lotus for meditation. Explore some other positions and let me know how it goes! 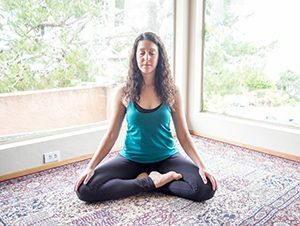 I have joint pain and cannot get into lotus positions. But every posture recommended eventually falls back on those positions. I’m 72 years old. All of the people I see meditating in books are young and able to sit cross legged. My legs won’t do that and me back would be in so much pain meditation would be out of the question. Hi John, Thanks for your message. Have you tried the first option presented in this article? Sitting in a chair with your knees over your ankles is a great option for those who can’t or prefer not to sit on the floor. I recommend it if you have trouble crossing your legs. 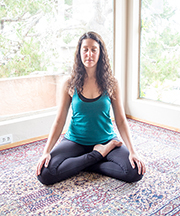 Lying down is also an option if you can’t sit upright during meditation. Let me know how it goes! Best of luck to you. I work at the VA helping women veterans with mental health issues. This is a great page. 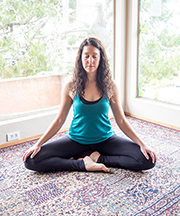 May I use it and the photos to help teach women to meditate? I will give attribution to your website.